Matteo Darmian has many reasons to celebrate after sealing a 2-0 win over Crystal Palace with his first Manchester United goal and earning the club’s Man of the Match award. 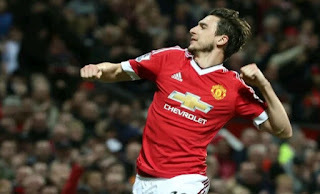 The Italian defender produced a true moment of magic during Wednesday's Barclays Premier League victory at Old Trafford, as he latched onto Damien Delaney’s failed clearance on 55 minutes to smash home a left-footed volley from the edge of the penalty area in front of a jubilant Stretford End. During his post-match interview with MUTV , Darmian was understandably pleased with his first goal for the club and also revealed another cause for celebration, with 20 April also being his anniversary.